Israeli soldier shot live ammunition and tear-gas bombs at Palestinian students who were leaving their school in the northern occupied West Bank village of Tell in Nablus yesterday. Palestinian security sources said Israeli settlers attacked Palestinian vehicles as they travelled along the main Nablus-Qalqilya road near the illegal Israeli settlement of Yitzhar. No injuries were reported in either incident however cars were damaged. Ghassan Daghlas, an official who monitors settlement activity in the northern West Bank, said that Israeli settlers threw rocks at Palestinian vehicles near the Yitzhar settlement, causing damages. Israeli settlers blocked the road near Yitzhar. Palestinian towns and villages in the Nablus area are surrounded by Israeli settlements and outposts, many of which are protected by the Israeli military. Eighty-two Palestinian refugees were detained and tortured to death in the Syrian regime’s prisons in 2018, the Action Group for Palestinians of Syria revealed in a report yesterday. The rights group noted that its statistics were based on a number of notifications received from the Syrian regime’s security branches, adding that the data was verified by the victims’ families. The death toll, the report added, might be greater than what has been documented due to the Syrian regime’s concealment of the detainees’ names, in addition to the victims’ families’ fears of prosecution by the Syrian authorities if they disclose such information. The UK-based group has previously documented the detention of 1,711 Palestinian refugees in Syrian prisons, most of whom have been forcibly disappeared and are being held in unknown locations. Unknown assailants raided the headquarters of the Palestinian Broadcasting Corporation (PBC) in Gaza City in the besieged Gaza Strip this afternoon and destroyed equipment. The Palestinian Authority (PA)-owned WAFA news agency reported that a group of masked men, armed with batons, sharp objects and pistols raided the PBC headquarters in Gaza City’s neighbourhood of Tal Al-Hawa. The armed men destroyed equipment and tools inside the headquarters, including transmission and recording equipment, cameras, computers, furniture and surveillance cameras. They also destroyed the archives and portraits of Palestinian President Mahmoud Abbas and late president Yasser Arafat. A Ma’an reporter said that the raid took place at the time of Friday prayers when the office was almost empty. It went on to call on all Palestinian factions, human rights groups, civil institutions and the international and Arab federations to protect journalists and media organisations operating in the Gaza Strip. Israeli occupation forces once again used force to disperse unarmed Palestinian protesters in the besieged Gaza Strip today injuring dozens. Thousands of demonstrators marched near the fence separating Gaza from Israel in what has been dubbed the “Friday to resist normalisation”, reaffirming Palestinians’ absolute rejection of normalising relations with the occupation state. Occupation forces fired bullets and tear gas canisters at demonstrators, injuring a number of them and causing other to duffer suffocation. Palestinians have been holding weekly protests I the Gaza Strip since 30 March calling for an end to the stifling siege which has been in place for nearly 12 years, and for their right to return to the homes from which their families were forced out in 1948 to make way for the creation of the state of Israel. Israel’s oppressive policies against the peaceful demonstrators has lead to the death of 256 and injured some 30,000 more. The Egyptian army had destroyed 37 cross-border tunnels linking the besieged Gaza Strip and to the country’s Sinai Peninsula in 2018, the army announced yesterday. “The Egyptian army has 37 hidden tunnels in northern Sinai during 2018,” the military said in a statement. Egypt shuts the Rafah crossing – Gaza’s only connection to the outside world – most of the year. By virtue of its location on the Mediterranean Sea off the European continent, Egypt is a transit country for irregular migration to a number of European countries, particularly Greece, Italy and France. It is clear from this hadith that the believing men and women are required to seek knowledge. We have to capitalize on the potential of our valuable women; we should assist and support them in their pursuit for excellence in their careers and in their studies. Our Muslim women are contributing and achieving in many valuable ways, we have to encourage, support and help them in achieving more. The more our women achieve and excel, the more our Ummah (Muslim nation) will be revived. Our women are not only half of our Ummah, they are also the mothers who shape future generations. Prophet Mohammad PBUH valued them and gave them a special status. Women now have higher IQ Scores than men, as researchers confirm. Women are a precious gift to humanity and a source of kindness and compassion. Prophet Muhammad PBUH said: “Your Heaven lies under the feet of your mother.” (Ahmad, Nasai). A man came to the Prophet PBUH and said, ‘O Messenger of God! Who among the people is the most worthy of my good companionship?’ The Prophet PBUH said, ‘Your mother.’ The man said, ‘Then who?’ The Prophet PBUH said, ‘Then your mother.’ The man further asked, ‘Then who?’ The Prophet PBUH said, ‘Then your mother.’ The man asked again, ‘Then who?’ The Prophet PBUH said, ‘Then your father.’ (Bukhari, Muslim). There are many more verses and hadith confirming the value of mothers in Islam. Aisha Mustafa is a young Muslim lady who creates next-generation Quantum Space Propulsion Systems, thus reinventing space travel. Azza Abdel Hamid Faiad, is a 16 year old Muslim young lady who has worked out how to turn used plastic into biofuels. Ms. Hayat Sindi is a Saudi Scientist who is changing the world, she has helped develop a life saving tool that is the size of a stamp and costs just a penny, which helps detect disease by analysing body fluids. And here is Ms. Manal Alsharif, whose courage and struggle against the Saudi regime’s unislamic treatment of women has inspired many. She is one of the 100 most influential people in the world. Another one of the 100 most influential people in the world, is Ms. Samira Ibrahim who challenged the tyrannical Supreme Council of Armed Forces, aka Mubarak’s generals who are also considered America’s closest ally in the new Egypt when she was mistreated by their thugs because of her brave stance for freedom and justice. Dr. Reshma Khan is another brilliant example showing the universality of the message of Islam, she is a Muslim doctor who opened a free clinic for the poor of South Carolina. As Muslims, we should help all, Muslims and non Muslims. Allah confirms in the Quran, that men and women were created from a single soul, thus emphasizing the equality and appreciation that Islam has for women. Musa ibn ‘Ali reported that the Prophet PBUH said, “Shall I show you the greatest sadaqa (or one of the greatest forms of sadaqa)?” He replied, “Yes, indeed, Messenger of Allah!” He went on, “To provide for your daughter when she is returned to you and you are her sole source of provision.” Sadaqa means charity. A moment of introspection, have you supported and empowered the women in your life? Have you helped your sister reach her full potential? Have you helped your wife make her dreams come true? Have you helped your mother and taken some of her responsibilities off her shoulders? Do you treat women with the level of respect and appreciation that Islam requires? Have you reached out to do more for the women in your community? 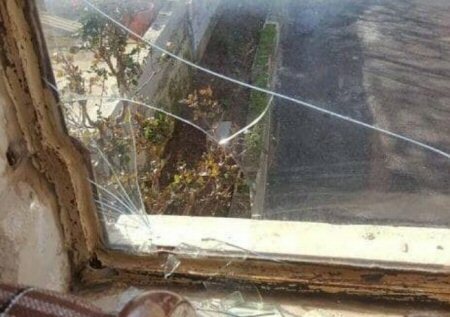 Israeli settlers, on Thursday, attacked the home of the Hammad family, in Silwad town, to the east of Ramallah, throwing rocks at its windows. Local sources reported that settlers attacked the house near the entrance to the town this morning, causing damage. In the town of Bruqin, west of Salfit, Israeli forces uprooted about 30 olive trees and cut down another 20 trees. Local sources in the town said that Israeli soldiers invaded the town and destroyed the olive trees belonging to citizens of the town. The Sheweiki family’s belongings outside of their demolished home in Qalandia, January 2, 2019. Photo credit: Wadi Hilweh Information Center. Israel demolished 480 Palestinian-owned structures in 2018, representing a 21 percent increase compared to 2017. Israeli authorities claim that the house lacks construction permits. According to the Wadi Hilweh Information Center, the owner of the house Hamza al-Mughrabi has attempting licensing his house under Israeli law for years. The Israeli municipality zones only 8 to 13 percent of East Jerusalem for Palestinian residential construction. As a result, many East Jerusalem residents are forced to build without permits to avoid overcrowding. The Association for Civil Rights in Israel found that 20,000 homes in East Jerusalem – 39 percent of all homes in East Jerusalem – lack Israeli construction permits. The United Nations Office for the Coordination of Humanitarian Affairs in the occupied Palestinian territories reports that Israeli authorities demolished 177 Palestinian-owned structures in Jerusalem in 2018, representing a 25 percent increase compared to 2017. In the West Bank, Israeli authorities demolished 283 Palestinian-owned homes, representing an 18 percent increase compared to 2017. In total, Israeli authorities demolished 480 Palestinian structures in the West Bank and Jerusalem in 2018, representing a 21 percent increase compared to 2017. Israeli forces continued with systematic crimes, in the occupied Palestinian territory (oPt), for the week of 27 December 2018 – 02 January, 2019. Israeli forces continued to use excessive force against peaceful protestors in the Gaza Strip. A disabled Palestinian was killed in eastern Khan Younis, while 25 civilians, including 5 children, a woman, a journalist, and 2 paramedics, were wounded; the injury of one of them was reported as serious. In the Gaza Strip, on the 40th Friday, 28 December 2018, the Israeli forces killed a Palestinian civilian with a disability in excessive use of force against Palestinian protestors in eastern Gaza Strip, though the demonstrations scaled back for the ninth week in a row and most means usually used during the demonstrations were almost absent since the beginning of the Return and Breaking the Siege March 8 months ago. According to PCHR’s documentation, the civilian killed was the 8th one of the persons with disabilities, who were killed by the Israeli forces during those demonstrations. As part of using excessive force against the peaceful protesters along the Gaza Strip borders, during the reporting period, Israeli forces wounded 25 civilians, including 5 children, a woman, a journalist, and 2 paramedics. The injury of 1 of those wounded was reported serious. As part of targeting the Palestinian fishermen in the sea, the Israeli forces continued to escalate their attacks against the Palestinian fishermen, indicating the on-going Israeli policy to target their livelihoods. Those attacks during the reporting period resulted in the arrest of 2 fishermen and confiscation of their boat. As part of targeting the border areas, on 31 December 2018, Israeli soldiers stationed along the border fence between the Gaza Strip and Israel opened fire at the agricultural lands in eastern Deir al-Balah and al-Maghazi in the central Gaza Strip. While no farmers were reported wounded, they had to leave their work behind in their lands. During the reporting period, Israeli soldiers stationed along the border fence between the Gaza Strip and Israel, east of Rafah, opened fire at the shepherds and agricultural lands 17 times, forcing the farmers to leave their agricultural lands. However, no casualties were reported. As part of the airstrikes, on 29 December 2018, Israeli helicopters fired a missile at a military site belonging to the Palestinian armed groups, southwest of Deir al-Balah in the central Gaza Strip. As a result, the site sustained damage, but no casualties were reported. In the West Bank, during the reporting period, Israeli forces wounded 3 Palestinian civilians, including one of them sustaining serious wounds, in separate shooting incidents. During the reporting period, Israeli forces conducted at least 68 military incursions into Palestinian communities in the West Bank and 8 similar incursions into Jerusalem and its suburbs. During those incursions, Israeli forces arrested at least 54 Palestinians, including 9 children, in the West Bank. Moreover, 14 others, including 2 children, were arrested in Jerusalem and its suburbs. In the Gaza Strip, on 28 December 2018, Israeli forces moved 100 meters into the western side of border fence with Israel in eastern al-Bureij in the central Gaza Strip. As part of house demolitions and demolition notices, on 02 January 2018, Israeli munipality bulldozers demolished a house belonging to Hamzah al-Mughrabi in Qalendia village, north of occupied Jerusalem, under the pretext of building without a license. The 1-storey house that is built on an area of 100 square meters was rented by al-Mughrabi Family of 6 members, including a person with a disability. It should be noted that the house was built 5 years ago and its owner managed to delay the demolition many times, attempting to obtain a license from the competent authorities. Moreover, the Israeli municipality imposed on him a construction fine of NIS 35,000 and another NIS 30,000 as expenses for the municipal teams. As part of settlement crimes and demolitions, on 31 December 2018, Israeli forces uprooted 50 olive trees planted 3 years ago and iron beams fixed in the vicinity of the land and confiscated them. The olive trees belonging to Sa’id al-‘Amour (55), from Kherbet al-Rakiz in eastern Yata, south of Hebron, were uprooted claiming that the land which was reclaimed and planted with trees is classified within the State Lands where any work is banned unless there was a prior authorization from the Israeli authorities. 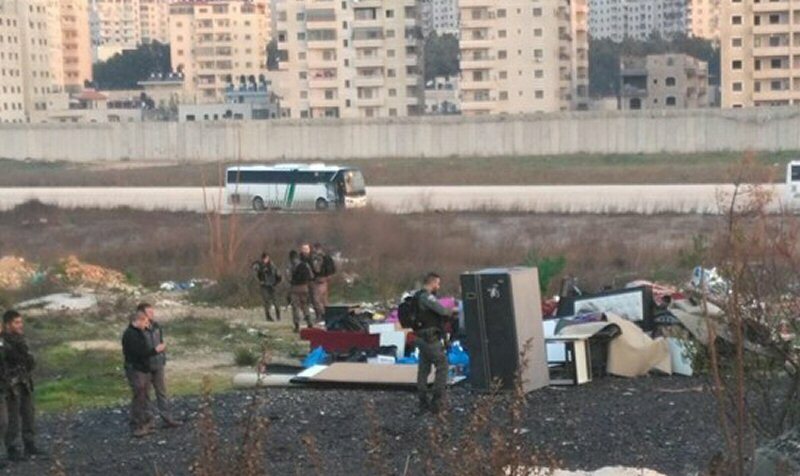 On 02 January 2019, Israeli forces confiscated a mobile room (caravan) belonging to Belal Fanoun (50) from Kherbet Khelet ‘Adas in northern Bethlehem. As part of the Israeli settlers’ attacks against the Palestinians civilians and their property, on 28 December 2018, an Israeli settler from “Ramat Yishai” settlement outpost attacked Hatem Muhtaseb (25), from Tal al-Rumeidah neighborhood in central Hebron, when he was on his way to buy medicine from a pharmacy in Bab al-Zaweyah area. As a result, al-Muhtaseb sustained bruises and one of his teeth was broken. At approximately 01:30 on Thursday, 27 December 2018, Israeli forces moved into Silwan village, south of occupied East Jerusalem’s Old City. They raided and searched a house belonging to Adam al-Reshiq (17) and then arrested him. At approximately 01:30 on Sunday, 30 December 2018, Israeli forces moved into Silwan village, south of occupied East Jerusalem’s Old City. They raided and searched houses, from which they arrested 2 civilians, including a child. The arrested civilians identified as Yazan Mohamed al-Froukh (16) and Zuhair Khadir al-Rajbi (48) were taken to an investigation center for interrogation. At approximately 01:00 on Monday, 31 December 2018, Israeli forces moved into al-Mukaber Mount area, south of occupied East Jerusalem. They raided and searched a house belonging to Ashraf Salem ‘Owisat and then arrested him. Around the same time, Israeli forces moved into occupied East Jerusalem. They raided and searched a house belonging to Mohamed Kamal Gharablah and then arrested him. At approximately 01:30, Israeli forces moved into Sho’fat refugee camp, north of occupied East Jerusalem. They raided and searched 2 houses belonging to Diyaa Mohamed ‘Ali and Ayman ‘Adwi Da’ajnah and then arrested both of them. Around the same time, Israeli forces moved into many neighborhoods in occupied Eat Jerusalem’s Old City. They raided and searched houses, from which they arrested ‘Alaa al-Haddad, Marwan Najeeb and Subhi Najeeb. At approximately 02:00 on Monday, Israeli forces moved into al-Zaytoun Mount area ( al-Tour), east of occupied East Jerusalem. They raided and searched houses, from which they arrested Yousef Sami Abu al-Hawa, Hisham Abu al-Hawa and Ameen Khadir Abu al-Hawa. Around the same time, Israeli forces moved into al-‘Issawiyia village, northeast of occupied East Jerusalem. They raided and searched a house belonging to Mohamed Halaiqah and then arrested him, taking him to an unknown destination. At approximately 06:00 on Wednesday, 02 January 2019, Israeli forces backed by military vehicles and police officers and accompanied with the Israeli Municipality staff and a digger moved into Qalandia village, north of occupied Jerusalem. They surrounded a house belonging to Hamza al-Moghrabi and gave him few minutes to vacate the house content. After that, the Israeli bulldozer completely demolished the house under the pretext of non-licensing. The 100-sqaure-meter house, which was comprised of 1 floor and rented by al-Moghrabi Family, was sheltering 6 members, including a child with disabilities. It should be noted that the abovementioned house was built 5 years ago and his owner managed to delay the demolition many times. He was also attempting to license the house from the component authorities. 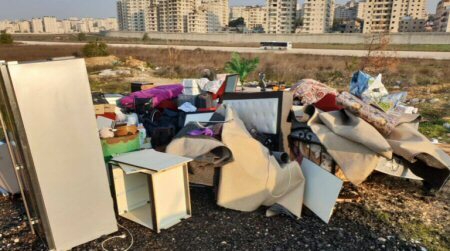 The Israeli Municipality imposed a fine on him estimated at NIS 35.000 and he paid NIS 30.000 for the municipality staff as demolition costs. At approximately 10:00 on Monday, 31 December 2018, Israeli forces backed by military vehicles and accompanied with a vehicle of the Israeli Civil Administration moved into Kherbit al-Rakeez, east of Yatta, south of Hebron. The Israeli soldiers deployed in the vicinity of al-Kherbah while the Israeli Civil Administration officers uprooted around 50 olive trees planted 3 years ago, damaged iron beams fixed on the plot of land and then confiscated them. The uprooted trees belong to Sa’ied Mohamed Rabba’ al-‘Imour (55). The trees were uprooted, claiming that that land, which was reclaimed and planted with trees, is classified as “ State Land” and working in it is forbidden without taking a prior permit from the Israeli authorities. At approximately 08:00 on Wednesday, 02 January 2018, Israeli forces backed by 3 military vehicles and accompanied with a vehicle of the Israeli Civil Administration and a mounted-crane truck moved into Kherbit Khelet al-‘Adas, north of Bethlehem. The soldiers deployed in the southern area of al-Kherbah and then confiscated a mobile room (caravan) from a plot of land belonging to Belal hmed Fanoun (50). Around the same time, Israeli forces backed by 3 military vehicles and accompanied with a vehicle of the Israeli Civil Administration moved into Nahaleen village, west of Bethlehem. They stationed in the western area of the village, where the Israeli Civil Administration officers handed Samer Fayiz Shakarnah notices to stop construction work in his 130-sqauremeter an under-construction house, under the pretext of non-licensing. Moreover, Shareef Musallam Najajrah received a notice to stop construction work in an agricultural room under the pretext of non-licensing. RAMALLAH, PALESTINOW.COM — The Palestinian Ministry indicated in its monthly report that further Israeli violations occurred against Palestinian journalists in the Gaza Strip, the occupied West Bank, and Jerusalem during December. 77 violations were documented over the past month and extended to include attacks on 36 journalists, including four women. The report also documented the attack on WAFA news agency building. A number of journalists were wounded during the raid.